You may learn the application of Lean Six Sigma Templates that are widely used in Six Sigma Projects. You may download the templates of Define, Measure, Analyse and Improve phases at no cost here. 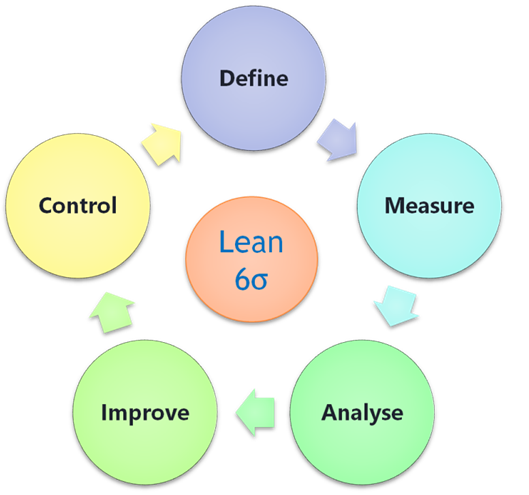 Why is Lean Six Sigma so Effective? Every organisation wants to improve their performance, processes and solve their problems. There are quite a few methodologies available for the teams to follow. Though the managers and the leaders are experts or experienced in their fields when it comes to solving their problems, they need to adopt a new methodology. The Six Sigma methodology – evolved over the past 3 decades – is still the most widely applied tool that guarantees success and quantum money savings. It is still evolving by adopting the new and relevant tools into its basic framework. People who experienced the power of Six Sigma will agree that the success comes from its structure – the DMAIC steps. The discipline of following the sequence gives a solid and proven methodology to problem-solving. In Define Phase, we are concerned about understanding the problem and planning to manage to solve this problem. If the business is facing problems with its top line, then the team has to focus on customer related problems. Here, we will try to understand the voice of customers, categorise those requirements using Affinity Analysis. The Affinity Analysis gives an idea of the major concerns of the customers – probably the company could not grow its customer base because it is not performing as expected by the customers in these concern-points. We use the Kano Model to prioritise customer concerns. It talks about 3 categories of concern-points or features or factors namely, Hygiene Factors, Performance Factors and Wow Factors. We need to attend the concern-points falling under the hygiene category with top priority in Six Sigma projects followed by Performance category. It becomes a strategic decision to either work on Wow factors or not. Here we translate the Voice of Customer to the language that is understood by the people in the business or shop-floor. We derive Critical to Satisfaction (CtS) points from the customer requirements or feedbacks. Then the CtS will be converted into Critical to Quality (CtQ) parameters. The CtQ parameters are the measurable parameters in the process of business that has to meet a certain level to meet the customer requirements. If the company’s biggest concern is the bottom line, then we take the approach of identifying the Six Sigma projects from the RTY analysis. With this analysis, we can identify the real pain area within the chain of processes. We call the measurable performance parameter of a process that will have an impact on the business problem as Project ‘y’. We derive the Project ‘y’s from CtQs or Yield Analysis. SIPOC is the acronym for Supplier – Input – Process – Output – Consumer. We identify the process steps within the value chain that will impact the Project ‘y’. The list of such steps forms the column of ‘Process’. And we list the process steps which supply the inputs and steps which consume the output. Project Charter is a one-page document that states the need for the project, team members involved, the goals undertaken by the teams and timeline. We convert the real world problem into the mathematical problem in measure phase by quantifying it in the universal sigma scale. Here, we calculate the yield of process steps, defect levels as ‘Defects Per Million Opportunities (DPMO). We may also calculate process capability using Cp and Cpk values. Then we convert the measurement of yield (%) or DMPO or Cpk into the Sigma Scale. This Sigma level reveals the intensity of the problem. We start the analyse phase with the question of ‘why our process capability is low?’. We use classical brainstorming, fish-bone analysis, FMEA etc. to arrive at the list of all possible causes. Then, we move on to drill down to the root causes with Why-Why Analysis. We will then filter the root causes based on the probability of success. The probability of success is calculated based on relative scoring called RCPN (Root Cause Prioritisation Number) in a similar way to FMEA. We need to validate the prioritised root causes before going ahead. We use the Validation plan for planning and conducting such validations. Finding out or generating solutions to the root causes. We use classical brainstorming, anti-solution brainstorming or TRIZ (Theory of Inventive Problem Solving) for finding out solutions. With a list of potential solutions, we weigh them based on the effort-benefit analysis. With effort-benefit plot, we will filter the most viable points as solutions and proceed to implement those points with an Action Plan.